In an email sent to supporters today, Republican presidential contender Herman Cain aggressively attacks the first woman to publicly accuse him of sexual misconduct, Sharon Bialek. Under the subject line, "Who is Sharon Bialek?" the email lays out Bialek's history of filing civil lawsuits as well as her shaky financial history to put her motives into question. "The fact is that Ms. Bialek has had a long and troubled history, from the courts to personal finances - which may help explain why she has come forward 14 years after an alleged incident with Mr. Cain, powered by celebrity attorney and long term Democrat donor Gloria Allred," the email says. The email gives a preview of what Cain might say in a press conference in Phoenix on Tuesday afternoon, during which he has promised to address the allegations against him "head on." A total of four women have accused Cain of sexual harassment in the 1990's, when he served as chief executive of the National Restaurant Association, though Bialek is the first to do so publicly. 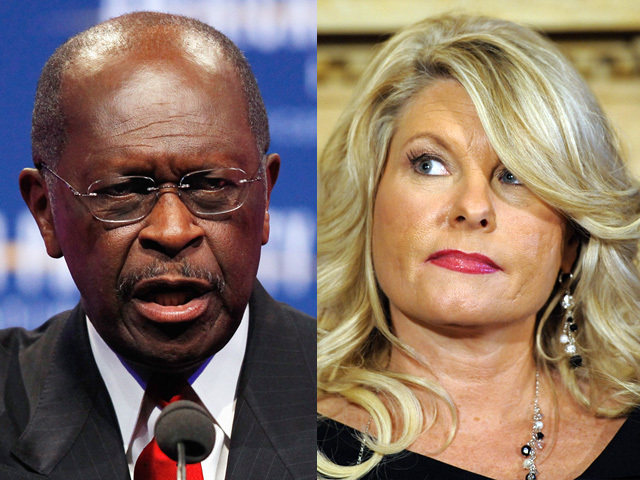 On Tuesday, a fifth woman came forward with a story of questionable behavior on Cain's part. In a press conference Monday, Bialek said that after a dinner meeting in 1997, Cain put his hand under her skirt and pushed her head toward his crotch. As his reputation suffers from the building allegations, several Republicans have said the best thing Cain can do for his campaign is directly address the charges. While some have suggested that could mean clarifying any incidences that might have been interpreted as sexual harassment, Cain has emphatically maintained his innocence. In today's email, the Cain campaign once again calls Bialek's charges "patently false." The email lists six specific civil lawsuits in which Bialek was a defendant, and it cites a news report saying that Bialek was sued over a paternity matter in 1999. The email also says that public records show Bialek has filed for bankruptcy twice and worked for nine employers over the last 17 years. "The questions should be - who is financing her legal team, have any media agreed to pay for her story, and has she been offered employment for taking these actions?" the email says. Bialek on Tuesday said on CBS' "The Early Show" that she came forward "because I wanted to help [Cain]. I wanted to give him a platform to come clean, to tell the truth." In an interview with ABC News/Yahoo on Tuesday, Cain said he doesn't remember ever knowing Bialek. "I don't even know who this lady is," he said. A new Wall Street Journal/ NBC poll shows that the percentage of people with a negative opinion of Cain has risen to from 18 percent in October to 35 percent. Among Republican primary voters, the percentage of those with a negative view of the candidate rose from 6 percent in October to 19 percent. Still, the percentage of Republican primary voters with a positive view of Cain stayed the same at 52 percent. On top of that, the poll shows Cain is still statistically tied for first place with Mitt Romney among Republican primary voters. The poll was conducted Nov. 2 - Nov. 5; initial reports of harassment charges against Cain broke on October 30. Romney addressed the charges against Cain for the first time on Tuesday in an interview with ABC News and Yahoo. "These are serious allegations, and they're going to have to be addressed seriously," he said. Referencing Bialek's specific allegations, he added, "This woman's charges are particularly disturbing and they're serious." Up to this point, Cain'sstrong favorability ratings stood out as noteworthy when compared to the ratings voters give the rest of the GOP field. But conservative leader Bob Vander Plaats told the Des Moines Register that if Cain doesn't sufficiently address the harassment charges, a "cloud of doubt will envelop his candidacy." Vander Plaats is president of the Family Leader, an influential Christian conservative organization in Iowa, the first state to hold its presidential nominating contest. "The Iowa and American voter are fair when humility, sincerity and authenticity are communicated," Vander Plaats said. "This is a tipping point for the viability of his campaign."